Located just 40 m south of Denpasar, the provincial capital of Bali, Nusa Dua is well known for the high end hotels that swathe the peninsular. With easy access from both Kuta and Jimbaran Bay, Nusa Dua is celebrated for its glorious beaches of long white sandy shores and warm, safe waters. Less focused on the party atmosphere of central Bali, Nusa Dua places an emphasis on art and culture. The Pasifika Museum is highly recommended whether you are an art aficionado or not, but those particularly interested in the art of Bali, Southeast Asia and the South Pacific will be in their element. A worthwhile stop on your visit to Bali, the museum is rarely full leaving you free to check out the art at your own leisure and with little interruption or distraction. Keep your eye out for exhibitions focused on the European artists who made Bali their home as well as renowned local painters. The Indochinese exhibit and display of Polynesian artefacts are also particularly impressive. Serangan Island, also known as Turtle Island, is an excellent day tour for families, explorers and nature lovers alike. Glass-bottom boats departing from Nusa Dua and Tanjung Benoa afford amazing views of the diverse plant life and captivating tropical marine life as you journey to the island. As the name suggests, Serangan Island is a turtle conservation area where the locals keep and protect the eggs until they hatch when the young are then released onto the local beaches. Aside from turtles the island also has reptiles, birds, snakes and bats. The options for water sports and activities in Nusa Dua are virtually endless and depending on your level of skill and adventure you can try everything from banana boats, parasailing, jetskis, diving, fly fishing and more! 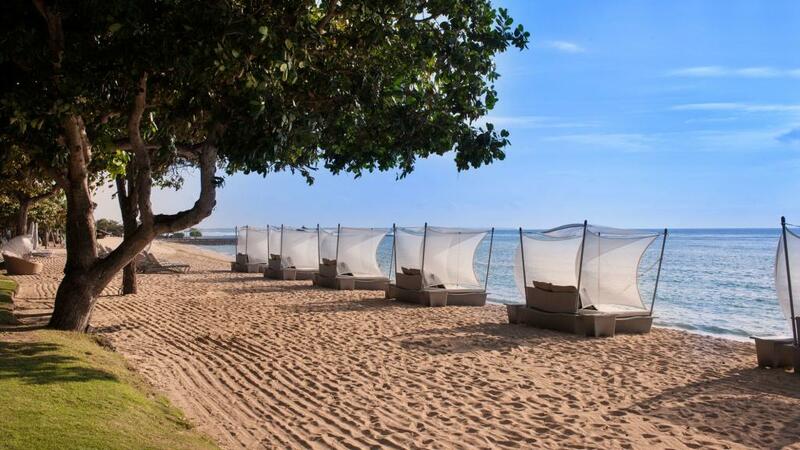 You can book these directly on the beach at Nusa Dua or Tanjung Benoa however a hassle-free option is to have your hotel organise this for you. If you're not so keen for the water sports and would prefer to keep your feet firmly on dry land then the Nusa Dua Golf and Country Club is a lot of fun. Whether you want to practise your swing or just sit back and watch, this is one of three top golf courses in Bali. Perhaps the most popular of all due to its convenient location, this is quite a busy course so it is wise to book a tee time to avoid disappointment. Your hotel will be able to arrange a round for you and if you ask about packages on offer this will more than likely also save you a lot of money. Getting around Nusa Dua is a breeze as there are many forms of transport the get you from A to B. Metered taxis and motorbike rentals are everywhere on the island. Renting a motorbike allows you the freedom to see the sights of the island at your own pace and the metered taxis operate 24 hours a day ensuring you'll never be stranded no matter the time of day or night. One of the most popular ways to get around is to rent a car. However, renting a self-drive car is not recommended as the congested traffic can be overwhelming. Hiring a car with fuel and a driver is an excellent choice, particularly for families. Drivers usually speak English and can act as guides ensuring you don't miss a thing!